Geothermal Heating Services Fredericksburg and Surrounding Areas | Robert B. Payne, Inc. Heating and cooling costs in Fredericksburg, Virginia, can skyrocket depending on the season. Cold winters can lead to higher heating bills and warmer summers result in pricey AC costs. But now there’s a way to vastly reduce those bills: geothermal heating and cooling. By having the pros at Robert B. Price, Inc. install a high-efficiency geothermal heating system in your home or business, you can save between 30-70% (perhaps as much as $1,500 in annual savings) on your monthly heating and cooling bills. Add in the hefty tax credit you’ll receive, and your system will pay for itself in no time! Pipes are placed underground vertically, usually drilled around 20 feet down, to core heat from the earth. This location within the ground stays the same temperature just under 60 degrees all year long. Heat is then extracted from the soil/ground in the form of water that is pumped through the pipes. Water is carried up and into a heat pump, which draws heat from that liquid to warm the air in the home. The process loops, bringing in consistently warm air no matter what the outside air temperature is. For commercial property, geothermal heating technology can also be utilized. Although it is on a significantly larger scale, the process is much the same. An infographic from National Geographic provides a good visual for geothermal heating implementation within a city. Whatever the location, commercial or residential, the process of geothermal heating is extremely energy efficient, and countries around the world are implementing it yearly. Knowing this basic process helps home and business owners get a handle on why this type of heating could be useful. After understanding the cycle though, the next question customers often ask is how much it will cost to install it. With installation of such an extensive system, the cost – from the heat pumps to the pipes underground – can be costly. Depending on the size and square footage of a home, the installation can be up to 25 thousand. However, the long-term benefits far outweigh the immediate cost. The geothermal heating system practically pays for itself in just a few years due to how much it can save on utilities. Investing in a geothermal heating system now can dramatically save on costs later. The upfront purchase comes with quality installation, full explanation of the process and how it works, and sometimes can even be financed upon credit approval with your HVAC company. Consider this option, and don’t let the price tag frighten you; after just a few months with this system in place, your wallet will thank you. Most don’t know this, but the ground absorbs nearly half of all solar energy the planet receives from the sun. This energy sits just under our feet, going to waste. As a result, the ground remains at a constant temperature just underneath the surface all year long. However, the temperatures above ground fluctuate significantly between summer and winter, making traditional heating and cooling less efficient when you require it. A geothermal heating system for homes takes advantage of the underground temperature using an efficient piping system. This pipe system is referred to as a “loop.” Water circulates throughout the pipes, exchanging heat between your home, the heat pump underground, and the earth. Doing so provides the interior of your household with constant, moderate temperatures, including hot water, with remarkable efficiency. Geothermal heating has surpassed all other heating methods to become a staple in many regions. Why? Because it works! Before installing a new heating system, it’s crucial to evaluate the energy load of the household. A more energy-efficient home helps reduce costs of a new system and your utility bills, while greatly improving the overall comfort of your home. The same goes for geothermal heating systems. While easily integrated alongside an existing heating or cooling systems, such as radiant flooring or traditional forced air, geothermal requires a water-to-air heat pump. The size of the heat pump and ground loop depends on the heating and cooling requirements of the entire house. This requirement is why we recommend an energy audit beforehand. Overall, the installation process is quite simple. The ground loop is installed in an outdoor location – somewhere with spacious room – and leads into the home. Typically, a 3-ton setup will suffice for your average household. We still need to consider home size, geology and soil, and land available to correctly size a unit, though. More and more homeowners are opting for geothermal heating solutions in their home. Geothermal heating offers fantastic benefits. Utilizing the heat stored within the Earth itself is crucial to a comfortable home. However, like any modern heating system, geothermal heat pumps require professional installation. If you opt for an amateur or untested installer, then you’re likely to experience issues. Such issues typically lead to costly repairs and ineffective heating. 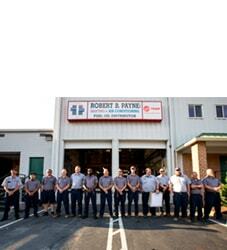 At Robert B. Payne, Inc. we’ve trained our technicians in geothermal heating technology to ensure you’re satisfied. The right system will provide heating, cooling, and even water heating. The system is designed to use the earth’s natural heat. Harnessing said temperature is no easy task, though. The system must be thoroughly designed for productivity and results. We’ll survey your home and develop the right system – in size and scope – to provide competent heating throughout your entire household. Renewable energy – A geothermal heat pump utilizes renewable energy from the sun; therefore there are no dangerous emissions. Installation – A geothermal system can be installed in new construction or in retrofit situations. Retrofit is often more expensive, however, as ductwork modifications are required. Quiet – The entire system is nearly silent. The interior unit is about as loud as your average refrigerator. The outdoor unit is buried underground, with no compressor or fan, so no noise. Geothermal heating is using the heat below the Earth’s surface to heat your home or business. It’s clean, renewable, reliable, and affordable. A geothermal resource is a reservoir of hot water that is typically a mile or more below the ground, within the Earth’s crust. By drilling into one of these reservoirs and tapping into that reserve of steam and hot water, home- and business owners can take advantage of this heat to run their HVAC systems. This technology has been around for more than 50 years, so it is time-tested and approved. Robert B. Payne, Inc. is proud to offer this money-saving, environmentally-friendly energy alternative to the Fredericksburg community. A geothermal energy system has two main parts: 1) a series of tubes/pipes that run underground and absorb the Earth’s steady, warm temperature of approximately 50° to 60°F, and 2) the heat pump, which circulates water or antifreeze through this maze of tubes. It’s very similar to a regular heat pump, which uses the outside air to create warmth, except the geothermal heat pump uses the Earth’s natural, internal heat. The heat pump takes this captured heat and sends it to a compressor, which adds pressure to make it into a hot gas, which then warms your home. 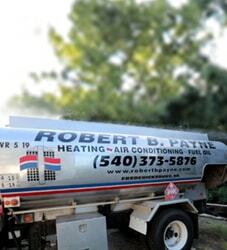 Contact the Robert B. Payne, Inc. team today for our geothermal heating services. 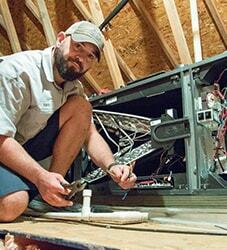 We can install your system immediately, offering you the very best in customer care and satisfaction. For more information, or any questions you may have, call (540) 373-5876 today!